With such joy, I offer you this conversation with Fawn Williams. Fawn and I sat down in my living room last week to talk over tea. After our interview (which is really just the beginning; she will definitely be back), Fawn gave me a tarot reading that was nothing short of magical. YESSSSS. So happy to share with you. Fawn Williams teaches nervous system regulation and functional movement with practical applications. This work is for everyone. Raised by two visual artists who first taught her about the human body through experiences like casting her hands in plaster, sculpting objects in clay, and watching figure drawing classes in the living room, Fawn’s family meditated together. As a small tyke, Fawn did gymnastics and entered the contemporary dance and martial arts worlds as a teen. Though her mom brought her to kirtan and meditation retreats from around age four, her yoga asana practice began in the mid-1990s in San Francisco where she studied performing arts. Yoga provided Fawn with integral self-regulation strategies that she continues to share with students. A foundation in mindfulness helps Fawn combine all eight limbs of yoga into practice, and truly live her yoga. 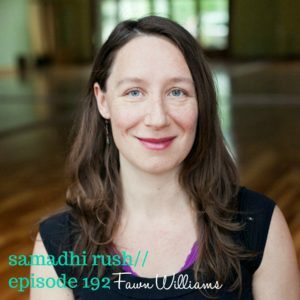 With a special interest in Biomechanics and yoga as complementary care, Fawn work with wellness teams to incorporate yoga into treatment, and has presented at conferences such topics as Trauma Informed Care, and the Neuroscience of yoga. In her private yoga therapy practice, Fawn holds space for people to land sweetly within. Fawn’s teachers and guides are many, and she honors Sarahjoy Marsh, Todd Jackson, Wendy Foster, Simon Menasche, and Sant Ajaib Singh Ji. Fawn is the founder of wellness programs at Pacific Northwest College of Art and Oregon College of Art and Craft. She holds a Bachelor of Fine Arts Degree, and teaches in the Dance Department at Portland Community College. Learn more about Fawn on her website: Yoga With Fawn. Deepest bows to Fawn for her sharing. Sweeties, let’s meditate together in MAY. 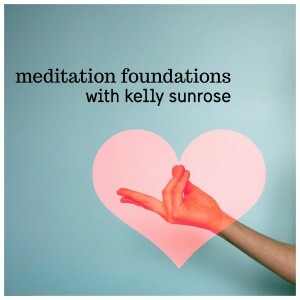 I’m offering my signature meditation class,MEDITATION FOUNDATIONS, online. At last. In this 5-week online experience, I share everything I know about nourishing the habit of practice while learning essential meditation techniques. This course is a blend of introductory philosophy, meditation technique and habit creation. Broken down into 5 modules, the program uses audio recordings, video lessons, writings and illustrations to help you create a simple, daily practice. This is the class I wish I had had when I began a seated meditation practice 16 years ago! BLISS LAB at LOVE HIVE!! Friday mornings at 6:30am. May 6-June 3. Take your practice alllll the way. SAVE THE DATE for our RETREAT in Sedona, Arizona. October 13-16. Registration opens in MAY. Just Breathe: A Complete Pranayama Practice. Yoga Anytime: use the code MAGIC for a free 30-day membership. You can listen online here. You can download to your favorite device or computer right here. Find us and subscribe in any podcast app by searching for “samadhi rush”.